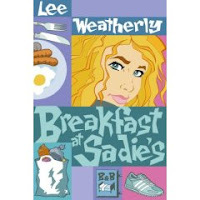 Author Lee Weatherly has flown under my radar until, well, about 2 weeks ago. I picked up Kat Got Your Tongue on a recommendation at the ILA conference and sat with it on Christmas Day and devoured it. I would have reviewed it then and there except that I discovered that two of Weatherly's other books have these cute matching covers. And I thought it would be delightful to review all three at once. Sadie is an underachieving cut-up in Breakfast at Sadie's. Her mom is always bugging her to get her grades up, telling her she'd do better if she just worked harder. Her friends automatically hand over their homework for her to copy and make cracks about how dumb she is. When Sadie's mom is diagnosed with an autoimmune disorder and has to spend several months in the hospital, unable to move, Sadie is left in the care of her young aunt. When Aunt Leona flits off on vacation, leaving Sadie by herself, Sadie takes over the bed & breakfast and quickly learns that she's hard-working and creative. She knows she can handle it, but she's afraid of what might happen if the authorities find out she's on her own, so she has to keep it a secret that she's the one running things. It's a fast-paced story and I kept turning the pages to find out if Sadie could really pull it off. Recommend this one to young entrepreneurs and for further reading about take-charge girls, hand them Joan Bauer's Hope Was Here and Catherine Murdock's Dairy Queen. In Kat Got Your Tongue, Kathy runs out in front of a car and is hit. When she comes to, she doesn't remember anything. She doesn't know who she is. She doesn't know why she was running. She doesn't recognize her mom or her friends. Kathy has amnesia. Chapters alternate between post-accident Kat and pre-accident diary entries from Kathy. As Kat tries to find out more about her life and to figure out why she was running away from her friends, readers follow Kathy's diary entries, which start three months before the accident. It all builds to a fever pitch when everything finally comes out in the open and people can start to make amends. I love that Kat and Kathy are completely different characters in the book, even though they're the same person. Kathy gets a clean slate and we see what Kat feels differently about. For another great teen amnesia book, check out Memoirs of a Teenage Amnesiac by Gabrielle Zevin. Don't let Lee Weatherly fly under your radar! I really enjoyed all three of these books and I'll certainly be checking out Child X and looking for more.